Note: I wrote something work-related, after years of silence in that regard! Revel in the novelty. Having read and considered the three recent articles on the lack of innovation in the digital asset management space, I can only agree that there are certainly issues with vendors, chief among them being the lack of standards, and it starts at the most basic level of simply describing their solution’s basic function. Major Vendor A can call their solution ‘digital asset management’ while Major Vendor B uses a broadly similar tool for web content management, but they can each easily swap labels if that’s what the customer thinks they want, perhaps because they don’t have anyone with real DAM expertise on staff to dig further into what’s on offer. And that goes to the core of Jeff Lawrence’s article – customers aren’t demanding clarity, much less innovation. 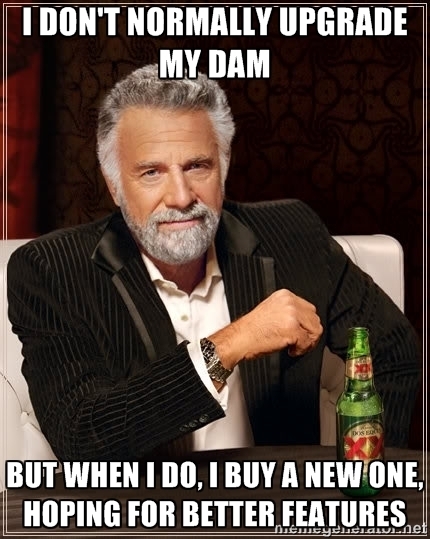 It’s almost depressingly common in our field to discover that the only person in an organization who truly understands how DAM works (or, perhaps, how it should work) wasn’t involved in the purchasing decision; they’ve often inherited something that wasn’t truly fit for purpose, and they don’t have the budget to do much about it now. But if the customer does not budget for enhancements or new systems, vendors can’t be expected to pay particular attention; understandably, they’ve moved on to selling their existing solution to a new client. Yes, new features may roll out if that bigger client demands more attention during the implementation phase, but after that, the feedback loop unravels. But standards are again top of mind in Ralph Windsor’s piece on the role of the media; his points about the truly alarming lack of metadata knowledge give one pause, and the difficulty in measuring ROI certainly takes time away from crafting the perfect taxonomy model. Some DAM vendors have clearly given careful thought to the role of taxonomy and metadata, and considered how users, both administrative and end-user, might interact with that metadata (even if they don’t know they are doing it). But that’s not true across the board, and if DAM enhancements have fallen to someone who lacks experience in that space, it’s difficult to move forward true functionality improvements, since all DAM functionality flows from useful, well-managed, metadata. And while we ‘know’ that the DAM saves money in the long run, demonstrating that to those who hold the organizational purse strings isn’t as easy as it should be. This can prove a particular challenge if the team (or, let’s be realistic – person) running a DAM is that rare IT unicorn with a combination development/project management/taxonomy background; suddenly they also need to become an expert in presenting on their program’s successes and challenges to senior management. While that’s a great career development opportunity (and you may detect the voice of experience here), tools within DAM software should make getting to that supporting data simple. To summarize, my view is that there is a lot of truth in each article, and it’s something of a vicious circle. DAM vendors (or vendors that have decided they have a DAM solution, even if it’s far from best of breed) aren’t incentivized to innovate because the clients don’t demand it. Clients don’t demand it because they have systems that can be difficult to use, and therefore hard to build a business case around further improvements when they’ve already spent their initial budget – not infrequently on the ‘wrong’ system, so they are essentially starting from scratch again when they can afford to ‘go shopping’ once more. And much DAM media is so internally-focused that the ‘right’ people in organizations that need DAMs don’t even know it exists. It seems that one solution would be for DAM vendors to seek out long-term DAM managers and librarians for product management roles – people who live and breathe the tools, and who understand the importance of standards – to really push the next generation of DAM solutions. And as DAM professionals, we also need to keep the conversation going with our vendors; it’s not always easy, and there isn’t always a response, but keeping quiet hasn’t helped so far. Let’s get loud! Well done here. Found this through Ralph’s article. I like your comments and your view – and especially your lack of pessimism. When it comes to metadata standards, there are quite few standards in existence already. With respect to the DAM system we use (Canto Cumulus), we can create any schema easily. We can also save that schema as a metadata template for future use. The metadata standards I’ve seen, and there are quite a few, originate from industry associations (SCORM, DICOM, Darwin Core, Geospatial, DDI, EAD to name but a few), as they should. Do we really want a bunch of DAM companies trying to come up with a standard for medical imaging or digital evidence pr libraries? DAM companies should adopt these standards and any any other valuable metadata. There could be some organizational metadata required that doesn’t really apply to anyone else. Could you elaborate on what you would like the DAM industry to do with standards?